This thesis maintains that Victorian social cohesion depended to a significant degree on drink. In Norwich and other urban centres, population growth led to an expansion of the supply of alcoholic drink. Inadequate sanitation and water supply problems meant that beer answered a dietary need for a liquid that was safe to drink. Alcohol provided depressant comfort in the face of poverty and squalor for the working class. In these circumstances, most social and political functions were connected with the public house. 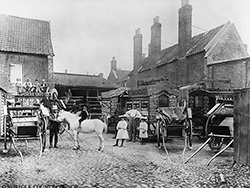 Most public houses in Norwich experienced sufficiently long periods of publican stability to have played an important role in the development of working-class communities. At a time of acute housing problems, the public house provided both a public space and relief from squalor. In Norwich and elsewhere, the urban elite used working-class dependence on drink to their own political advantage at election time through bribery, treating, and the control of organised gangs of ‘roughs’. These traditional practices were eventually proscribed by the government at Westminster but proved difficult to eradicate in Norwich. There was little overt interference with the infrastructure of drinking in Norwich. Although Norwich had the highest density of drinking places to population in England, the city could boast the lowest rate of drunkenness. This infrastructure was effective not least because brewers were key members of the urban elite and were influential in the Watch Committee that controlled the policing of the city. However, the Temperance Movement developed as a consequence of the challenge to traditional Christian ethics presented by the consumption of drink in this new urban context. By 1901, Norwich was becoming a more sober, compassionate and just society, but this was not due to the victory of Temperance but rather to a shift in the ‘structure of feeling’ that placed more emphasis on social responsibility. ‘Drink in Victorian Norwich’ is the title of my doctoral thesis, awarded by the University of East Anglia in 2003. I had been accepted as a part-time post-graduate research student in 1995 and then ran out of funds and delayed my formal enrolment until autumn 1996. Seven splendid years of academic research and writing followed under the exemplary supervision of Dr (now Professor) Richard Wilson. Like a juggler, I balanced the demands of my departmental headship in an Ipswich comprehensive with my secret passion in Norwich. During term time, five days a week I gave my all at the chalk face; on the sixth day I travelled to Norwich to work in libraries and study centres; on the seventh day I wrote up my research. Teachers have long holidays and during much but not all of those vacation weeks I wrote the chapters of my thesis. Not until very close to the successful conclusion did I come out of the academic closet and then only to a few colleagues at school. What sparked the doctoral project? Family matters played a big part. My father had died aged 84 in 1992 only a couple of years after a reconciliation had brought me back into my parents’ lives. My mother died in early 1995 aged 84. I saw her quite often during those couple of years of widowhood. I drove from the East Anglian coast to Leyland in Lancashire and back on numerous occasions and I look back on that time with love and affection. It was a time when there was fun and healing. After my mum had died, I was aware of an inner peace but also great energy and a yearning for a new project. Drink had played a significant part in my own life, one way or another. I was an historian by training and instinct. 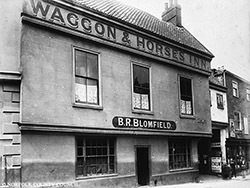 I lived within commuting distance of a city, Norwich, which once had more pubs per head of population than any other urban centre in the country. I wanted another taste of the academic life. And Norwich had a university. It only took a millisecond for the idea of the doctoral enterprise to seed itself. 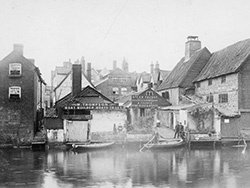 Images of Victorian Norwich courtesy of Norfolk County Council Library and Information Service.